Integrated to one thread with Training Laboratory. This mod adds Field Training Facility module in mobile lab.You can train your kerbalnaut with space stations and planetary bases. It consumes Time to train kerbalnaut. Unlike another mod, Training needs time elapses. examply, If you need level 5 kerbal from level 0, you need to wait 1 kerbal year at surface of kerbin. But if it's on orbit? Time consuming reduces 1/4. On surface of other planet? Time consuming reduces 1/6. It consumes 4 EC/sec per kerbalnaut. It means if you train 2 kerbal, It consumes 8 EC per second. Just right-click your lab with crew, and you can see how to use it. If exp reaches 100%, kerbalnaut will get experience of training. After get training exp, 'Level Up Crew' will work. Level indicator of this mod is not exactly same with current kerbal level. 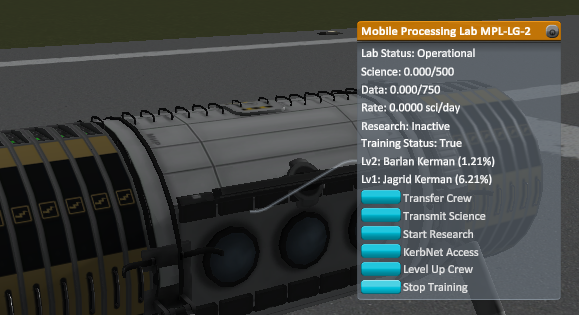 because this mod adds training to kerbal and concerns only progress of training, So if kerbal with many other experience and no training will be shown as level 0. because training level is zero.